The aerial photo used as a header on this blog was chosen because it reflects some of my historical interests – the sea, the development of the landscape and local history. The picture shows the entrance to Chichester Harbour in West Sussex. Although it is now mainly used by pleasure craft, and never had major port facilities, Chichester Harbour has a long and interesting maritime history. The Romans certainly used it – part of their invasion force may have landed there in AD 43, Fishbourne Roman Palace was built close to the channel visible at the top left, and the Roman city of Noviomagus Reginorum (Chichester) was close by. Seagoing Irish monks established a small monastery at Bosham in the 7th century (pronounced ‘Bozzum’), and from the Middle Ages the Harbour served as the outport for the city of Chichester. By the 18th century it was the centre of a big coastal grain trade, mostly carried in small vessels, because of the shallow depth of the water. The photo also shows some of the sandbanks that made entering and leaving the Harbour a challenging proposition in the days of sail. Despite this, a number of 5th and 6th-rate warships were built for the Royal Navy at Itchenor (just before the bend in the channel, top left) between the 1740s and early 1800s. Astonishingly, a couple of huge Eastindiamen were also constructed there in the 1780s. The sandy promontory in the middle ground is East Head, now a National Trust reserve. 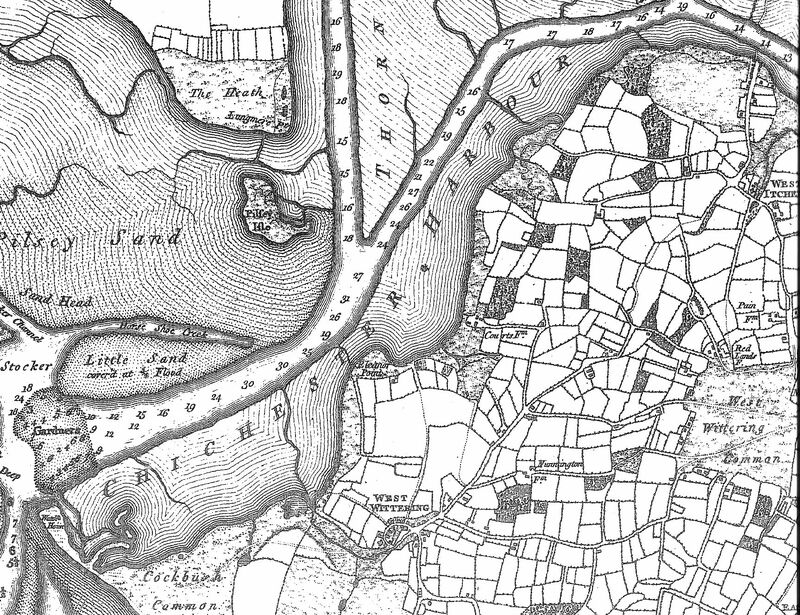 When you compare the 18th century Yeakell and Gardner map of East Head (below) with modern ones, it’s clear that in the course of 200 years or so the Head has been turned at right angles into the Harbour, such is the power of the sea. The land beyond East Head contains the villages of West and East Wittering, set amid a pattern of fields and lanes that originated in the medieval period. The soil of the Sussex coastal strip is very fertile, and this explains why the area had so much surplus corn and malt to export in earlier times. Chichester itself is near the top of the photo, almost obscured by encroaching sea fog. Even though the city has a tall cathedral spire, it isn’t always easy to make out, unless you’re standing at ground or sea-level (16th century French navigators noted it as a seamark they called ‘St Richard’, after the Cathedral’s most famous bishop). So, that’s why I like this picture. Two thousand years of history in one shot. And a pretty view. The fabulous Yeakell and Gardner map of Sussex was published between 1778 and 1783, and is more detailed than the first edition Ordnance survey maps published in the early 1800s. It shows much the same area as the aerial photograph, although west is at the left, not at the bottom, as in the photo.